MelodicRock Records brings you yet another interesting record. 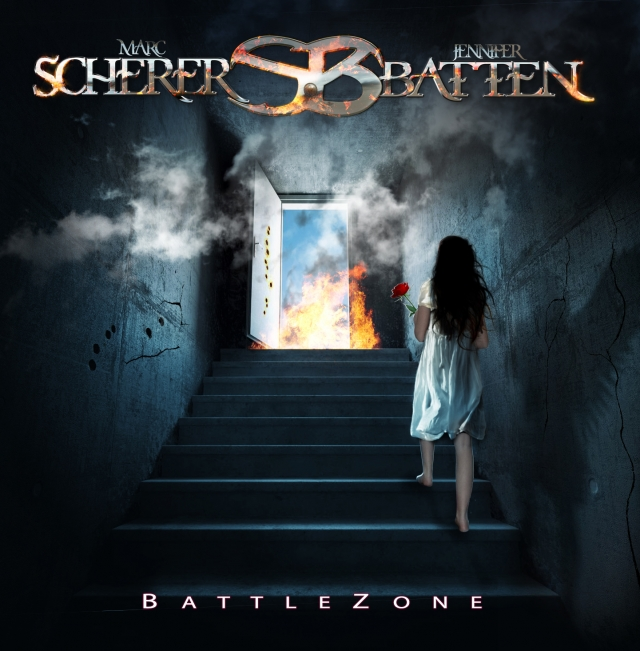 Marc Scherer ( lead singer of Peterik/Scherer and Lovecraft) and Jennifer Batten (who has toured worldwide with both Jeff Beck and Michael Jackson) join their forces here and creates a superb slice of pure and classic melodic rock album all the way. "Battlezone" features material exclusively from the songbook of writer/producer Jim Peterik (Ides of March, formerly of Survivor, Pride Of Lions). Featuring eight rare musical gems from Jim’s songwriting vault, the album also features three brand new tracks, written specifically for this project. "Crazy Love", the opener, is a really cool track; up-tempo, rocks good and it features some superb guitar lines! I just loved "Rough Diamond" at once! For sure another highlight out of this debut that grabs you at once and leaves you hungry for more. The hook and the chorus line are pure melodic rock bliss and makes you wanna whistle it for days. "What Do You Really Think", "The Sound Of Your Voice" (from .38 Special's 'Bone Against Steel' record ) and "Battlezone" are all three excellent melodic rock gems and all three feature tons of melodies, memorable choruses, great arrangements and a late Survivor vibe in it. The bluesier and mellower "The Harder I Try" is pure candy in my ears. Melodic as it gets, very emotional (Batten's guitar lines really shines here) and in one word EXCELLENT!! On closer we have a brilliant ballad, "All Roads", that closes this amazing record in a very positive way. One of the best melodic rock records of 2017! If you are a fan of Survivor or Pride Of Lions music, then look no further; get your copy NOW! Classy melodic rock stuff with quality that the sure thing is that will be a future classic among the AOR mafia out there.